Sewing Machine Tension Problems Sorted! 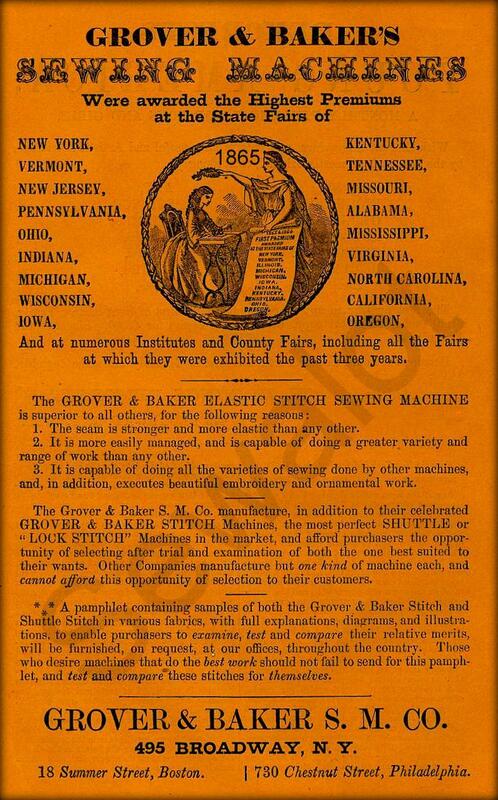 The Grover & Baker Sewing Machine Co of Boston Massachusetts was founded by two of the pioneers in sewing machine history, William O. Grover and William Emerson Baker. Both were Boston tailors. Often considered the Holy Grail to collectors, when the revolutionary Grover & Baker machines came out they were in a world of their own, let me tell you why. William Grover was fascinated by the early sewing machines and being a tailor knew what benefit a good sewing machine would make to his industry. 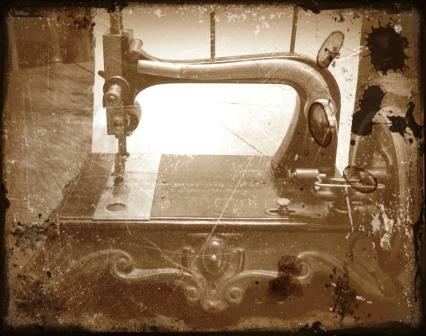 During the 1840’s he continually experimented with sewing machines while he was not busy making a living as a tailor. Of course the huge wealth he would acquire if he could make a reliable sewing machine would have been a great driving force and a stark contrast to the meagre living he could make hand-sewing clothes for other people. 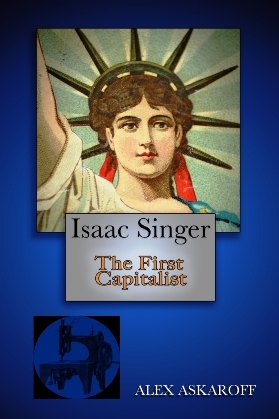 His genius was to prove the foundation of one of the most successful early sewing machine companies that competed with Isaac Singer. 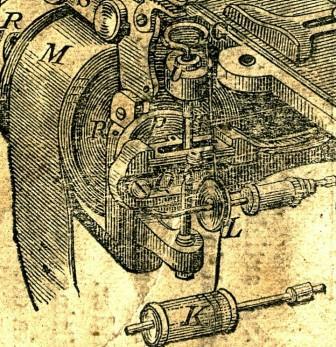 William Grover concentrated on the lower thread mechanism was soon granted his first patent. Spurred on by his partner more patents quickly followed in, 1851 and 1852. This badge from my G&B holds some amazing information. 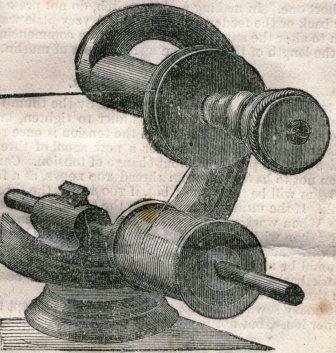 The May 8th 1849 patent is the Bachelder Patent used on their machine. The 1850 date is the A. B. Wilson Patent used. 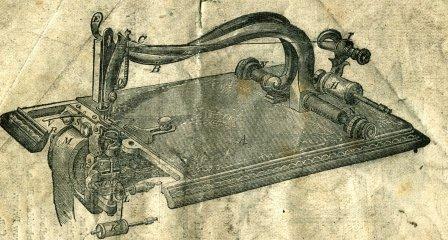 Here is the actual machine submitted to the Patent Office in 1857 by Wm. Grover. He was granted Patent 37,502 on Jan 27, 1863. The photo of this amazing machine was kindly sent in by Gary Kleiner. Most of the sewing machines that they made also incorporated the Elias Howe 1846 patent as no useful sewing machine could be made without the use of his patents for the steel shuttle and sewing machine needle. Grover & Baker got around the Howe shuttle by using a reel of thread beneath the machine as well as on top. However they could not get around the needle patent! The unique patented double knotted lower thread of William Grover. It has some similarities to the Barthélemy Thimonnier tambour stitch of 1834. During the life of the G&B Co many more patents were to come most would make them rich men but one in particular was to cause them a huge amount of trouble. William managed to figure out how to use a complete reel of sewing thread as the lower thread. This was a brilliant idea as it eliminated the need for a bobbin or bobbin winder. By the use of a lower looper, still used in over lock machines today, he produced a double-elastic chainstitch with a clever twisted double lower thread interlinking the upper thread. Hey it sounds tricky but it sewed like a dream. The unique Grover & Baker sewing machine lower thread system circa 1849, pure genius. This same system is still used on specialized pillar machines and over lock machines today. The stitch was strong and had excellent elasticity for fabrics and woollens. On top of this there was no bobbin. They were onto a winner. Think about it today wouldn't it be great to simply place a complete reel of thread under the sewing machine. By 1851 the business was up and running with a couple of investors/helpers-come-partners. One was a skilled mechanic brought in to help in the manufacture, Jacob Weatherill. The other was the shrewd lawyer Orlando B. Potter who was to guide the company through many stormy litigation's and eventually rise to president. No, not of America… Of Grover & Baker. In the same year as Isaac Singer patented his machine in 1851 Grover & Baker obtained a patent for forming a double loop stitch by means of two needles, one larger, lower needle being incorporated into the mechanism which we may now refer to as a looper. The Grover & Baker machine is now one of the most quiet and simple to use machines. The double thread leaves a ridge along the underside of the fabric. Many manufacturers find this objectionable, however those seeking more elasticity in their garments find it a bonus. Queen Victoria using a Grover & Baker model 13 sewing machine. Queen Victoria is actually Carole Allman who specializes in Victorian enactments. Orlando Potter was from the tiny hamlet of Charlemont in Massachusetts. 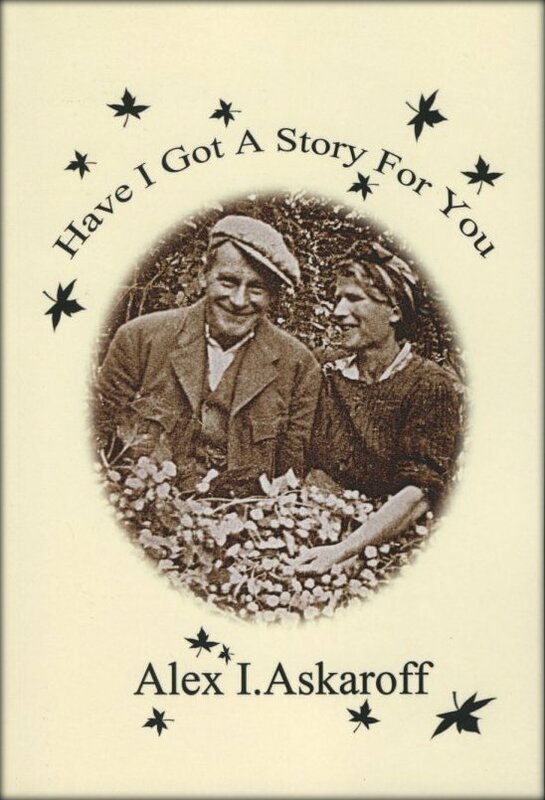 He was the son of a farmer who left the family hill-farm and at the age of 17 to better himself and find his fortune. Orlando Potter became a very wealthy man and his maiden daughter, Blanche, saved many of his letters for prosperity. Orlando was soon put to work when one of the G&B patents was attacked. A B. Wilson had invented a very similar feed mechanism, though it was unclear if he had actually patented it properly. Basically it was a set of teeth that moved the work forward then dropped out of the way and repeated the process for each stitch. Wilson called it the four-motion feed. The problem was that machines were already being sold with very similar feeds, even in Europe. Both companies Wheeler & Wilson and G&B ended up in court. 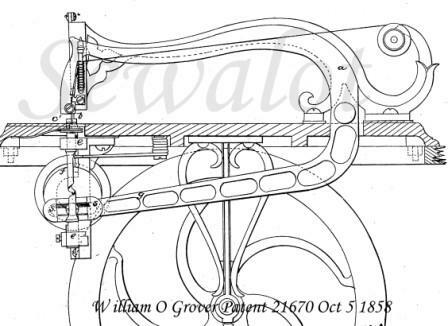 The William Grover patent of 1858 showing a beautiful treadle machine. Another big problem was that both the Wheeler & Wilson machines and the Grover & Baker machine looked similar, right down to the curved needle. The W&W model did have a unique rotary hook which I tell you more about on their own page. There was no doubt that someone had copied, even if it was subconsciously. 1862 Broadway New York. The Grover & Baker showrooms and offices. Orlando was doing well until Wilson produced a slightly earlier, very vague, patent for the four-motion feed mechanism. Rats! The case was lost and compensation had to be made. It is still in doubt who really invented the feed and Wilson, a nervous man by all accounts, never really made the huge gains he had hoped from it. 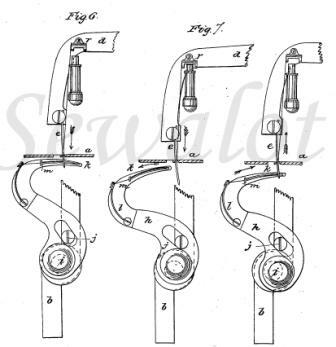 This is one of my favourite patents from Grover & Baker as it had all three main partners registering the patent. To all whom it may concern: Be it known that we, William O Grover and William E Baker and O B Potter, at present residing in the city of New York in the State of New York have invented certain new and useful improvements to sewing machines and to our Circular Needle Sewing Machine. 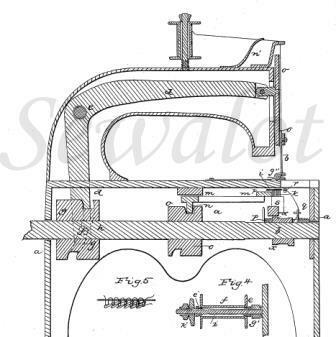 Patents are funny things, Singer never patented his treadle-come-packing-case even though he was using it daily in exhibitions and Willcox & Gibbs failed to patent their unique hook for a long time. However good old William O Grover did design and patent his first fully portable hand crank case. 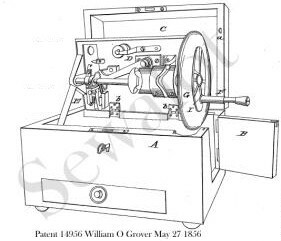 On the 27 of May 1856 William O Grover was granted patent No 14956 for his wooden case enclosing his sewing machine. Be it known that I, William O Grover of Boston, in the county of Suffolk and State of Massachusetts, have invented a new and useful improvement in Cases for Sewing Machines. Back to our four-motion-feed. There are two main types of feed mechanisms that are still in use today, the walking foot used by heavier industrial machines and the four-motion feed of Wilson's. Isaac Singer tried and patented a similar feed mechanism in 1855 but it never caught on as Wilson's feed was pretty near perfect which is why it is still used today. All this legal stuff was holding up production and sales. Something had to be done. Elias Howe was suing Isaac Singer and just about everyone else. Singer was suing everyone and chasing women in equal amounts. Grover & Baker were getting stuck in the middle of it all. As Mr Howe has devoted years of his life to the invention and development of the sewing machine, the public have compensated him at the rate of seventy-five thousand dollars a year. It has cost him, however, immense sums to defend his rights, and he is now very far from being the richest of the sewing machine kings. In one of the suits which Messrs Grover & Baker have had to sustain against Mr Howe we see that the testimony in that single case fills 3,575 pages. Then came a brainwave of outstanding proportion. Later on in our history it became quite illegal, though apparently it took an act of Congress to change the law first! Grover & Baker, Broadway, New York. By the 1850's just about every design of any importance in the manufacture of sewing machines had been patented by just a handful of men. Don't forget it costs money for patents. Even Elias Howe's dad had to mortgage the family farm. Orlando Potter suggested that if all the main patent holders got together rather than squabbling all day they could form a cartel. This in turn would effectively have a stranglehold on the new sewing machine business. They could charge loads of dosh for licences for anyone who wanted to make sewing machines and share the money out between themselves. Before long Grover & Baker machines were being sold all over the world. You can see below the offices in London and Liverpool. It was fitting that they had premises in Regent Street as Prince Albert and Princess Alexandria became patrons of the company. To celebrate Grover & Baker had a silver medallion stamped with their images on one side and the company sewing machine on the other. It is rare today. Back to our two Boston tailors. Production at their plant produced a whopper of a machine much like the first Singer model but with their unique double elastic stitch. Their first machines were big and bulky. Not the sort of machine you could take shopping or even move without the help of some strapping builder. Something had to be done and it was done in style. Another patent followed and the world was about to see another Grover & baker first. The first proper portable sewing machine the Grover & Baker circa 1856/7 the hand crank screwed in the side hole. The machine could be serviced and oiled without removal from its case. Patent 14956. Grover & Baker patented the very first small portable sewing machine. It is the machine, which many collectors recognise today. This became a best-seller and dominated the 1850’s with some 500,000 being made over a period of 20 years. Various models came out some with fancy silver-plating and mother-of-pearl but besides a curved needle and cosmetic changes they were principally the same machine. Grover & Baker prices from 1870. £4.10 was three months wages half the cost of a car today! These light running portable machines were the stuff of dreams, every household wanted one. People would travel miles to see this magical box that could be opened on a table and join any kind of fabric in seconds. It was the future. Hard to believe now but it helped shape the world we live in today. This is a fascinating picture sent in by Ray Evans possibly showing part of the Confederate Lookout Artillery Battery formed in the South. 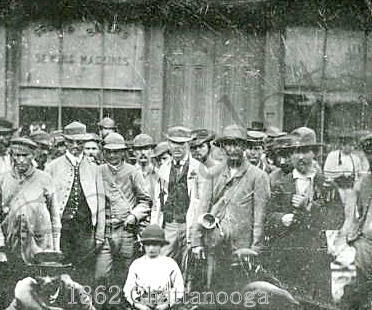 They are standing in front of a hardware store advertising Grover & Baker sewing machines. It is possibly Watkins Hardware but if anymore information comes to light please do mail me: alexsussex@aol.com. Photo courtesy of Tennessee State Library & Archive. During and after the American Civil War Grover & Baker were on a boom. They used the hire purchase schemes devised by Edward Clark, Isaac Singer's partner, which allowed ordinary folk like us to buy their dream machines and pay for them over a period of years. Edward Clark was the genius behind the power that help build Singer's into the giant that it was fast becoming. Interestingly G&B had expanded faster than their competitors with agents spreading across America and the world. Here is the Memphis, Tennessee agent actually contacting Singer sewing machines. This fascinating piece of information turned up on Ebay and I grabbed it. The letter is from Mr Valentine, agent for Grover & Baker in Tennessee. 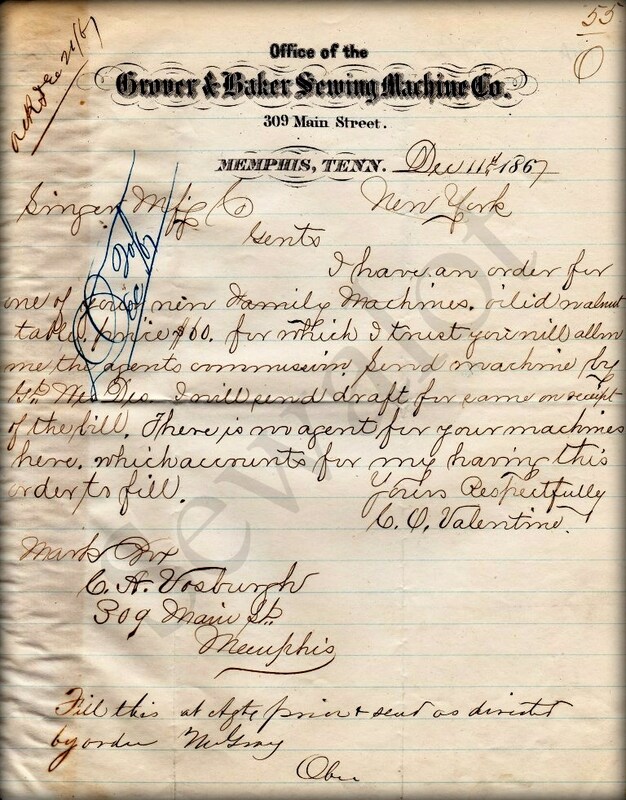 He is asking Singer to supply a Singer machine to a customer in Memphis as there was no Singer Agency set up there in 1867. He is also asking for the commission on the sale, which as you can see gets approved at Singers in New York. Production numbers for Grover & Baker from the Elias Howe licence agreement figures. As you can see the company was growing at a phenomenal rate. It was to be their glory years for G&B and the height of their production was between 1865 and 1870 the business flourished and some years over 50,000 machines were produced. A thousand sewing machines were hand assembled every week! That was the peek of the industrial revolution at the time. Tours were often organised to show fascinated customers around the plants. The Grover & Baker sewing machine cabinet in walnut. What a beautiful parlour piece. Now it was not all sunshine and roses. The machine produced a superb stitch but it had drawbacks. One was that it was bulky underneath and pretty useless in fine garment seams. This was not a problem when the competition was producing poor sewing machines but as they improved Grover & Baker stuck with their bulky stitches. It was to be their undoing. I made little sewing joke there… Okay I won't do anymore. The Grover & Baker sewing machine upper thread tension. The other problem was that the lower thread system, unique to Grover & Baker, was using up to three times the amount of thread that a normal sewing machine used. Thread was expensive with a single reel costing several days wages. Have you ever come across a reel of thread that has lots of loose ends wound round it? The reason is that thread was so dear not a length was wasted. Garments were often carefully unpicked and if enough of a length was saved it would be wound back onto a reel for future use. The Grover & baker treadles were beautifully cast and delicate. Note the central flywheel. Once again in the 1850’s people put up with the drawbacks of the Grover & Baker but by 1870 with the new Singer 12k and many other machines making a good Lockstitch. The days of Grover & Baker’s old-fashioned machines were numbered. High prices and old technology spelt the beginning of the end for the two Boston tailors. Now, I expect you are thinking why did they not simply not make a lockstitch machine to compete? Well they did, several in fact in lots of shapes and designs. But Orlando Potter, now in charge, was so wrapped up in doggedly promoting the old machine on which the business was founded that the company slid down and down against its competitors and along with it the profits dropped. The Grover & Baker Lockstitch model No9 complete with grumpy lady! Had the company moved on and concentrated all their efforts on their lockstitch machines they well have been the household name Singer is today. Research and development was the key area in which they failed to invest. A cutaway of the unique Grover & Baker system circa 1865, note the extra reel of thread beneath the machine. Heavy thread use, bulky seams, curved needles. It was all outdated by 1870 and more bad news was to come. The Sewing Machine Cartel had been broken up so no more license fees. The patents were all running out so no more protection. By 1874 things were looking bleak for the Company and sales were at rock-bottom. Cheap new competitors machines outsold Grover & Baker by 10 to1. A recession in North America proved the final nail in the coffin for the old company. Patent 33778, 1861 William Grover. Improvements to the Grover & Baker double-thread or looped stitch machine. These styles of loopers are still in use today on over lock machines. Amazing. However, cunning old Orlando was not silly, he had one final trick up his sleeve. 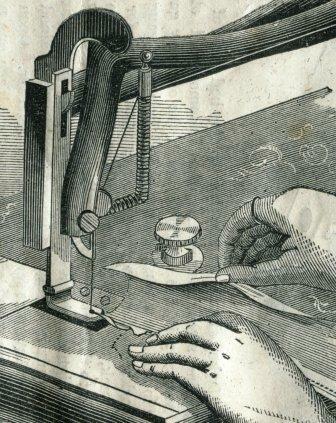 When the Domestic Sewing Machine Co were looking to expand he made Grover & Baker look like an ideal prospect. 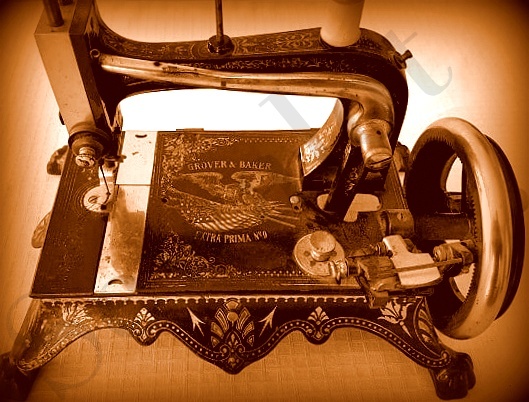 When The Domestic Sewing Machine Co made an offer for Grover & Baker he bite their hands off and took it, all the directors benefited from the merger. From 1875 the two businesses amalgamated but within a very short time all the Grover & baker machines were stopped. Outdated production and old tooling made the factory unviable. The last Grover & Baker, really a Domestic sewing machine in disguise. From cutting-edge technology Grover & Baker sewing machines had become dinosaurs in their own time. And so the names Grover & Baker fade into history, more casualties amongst the sewing machine pioneers. Law suits rumbled on right up until the 1890's but the business was long gone. William Emerson Baker retired to Ridge Hill Farms Amusements in Needham Massachusetts which he had opened in 1868. 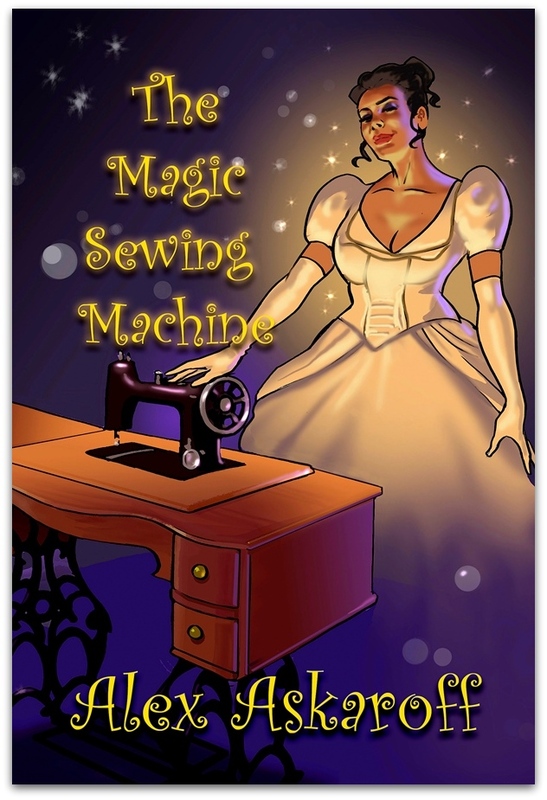 He had invested much of his large sewing machine fortune in the park, it was a sort of early Disneyland filled with all the latest attractions and technological marvels of the day. Hand crank Grover & Baker sewing machines are few and far between nowadays and dearly sought after by collectors. No serious collector of sewing machines can be without a sewing machine from the pioneers of Grover & Baker. The Grover & Baker Extra Prima No9 was on the market in 1902, many years after G&B had collapsed. It is reasonable to surmise that the great name of G&B was used (possibly under license) by another manufacturer to sell their machines. This has all the traits of a German made machine, cleverly decorated in American decals to appeal to the huge European and American markets. CO-OP Supplied a very similar machine as did Colliers. These are extremely rare machines today. Notice how the cast base above has changed to the simpler base on the Extra Prima but with similar decorations. Cost cutting like this shows the makers were trying to reduce prices. Image kindly supplied by Thor Andre Bjerkhaug from Norway in March 2019. Today Grover & Baker machines are no more than whispers from the past and sought after by all keen collectors. I have one, a model 13, in my collection. I often look at it and sometimes get it out to clean and oil it. The machine still makes a super stitch and I can see in my minds-eye the two Boston tailors peering over my shoulder with satisfied smiles. Grover & Baker may not have modernised like other competitors but they did produce some of the most luxuriously decorated sewing machines. The one below is more like the ceiling in the Vatican! Can you imagine what it looked like when it was new? Simply fabulous. When Grover & baker did something they sure went to town. 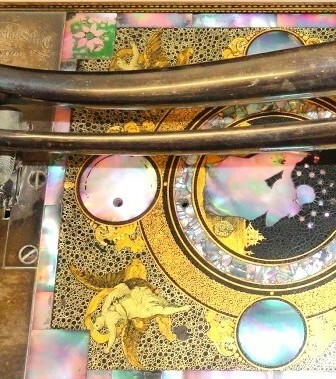 This is their mother of pearl machine and looks more like a ceiling in the Vatican than a sewing machine. William O. Grover and William E. Baker were once giants amongst the pioneers of the sewing machine trade. Say what you like but the quality of there machines seem to defy time itself. 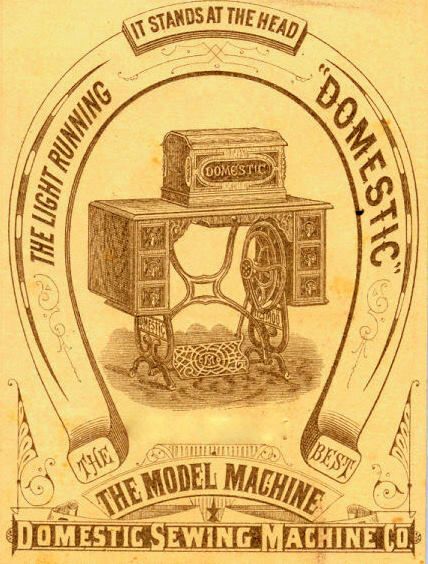 The takeover of Grover & Baker spelt the demise of one company and the rise of another, the Domestic Sewing Machine Company. 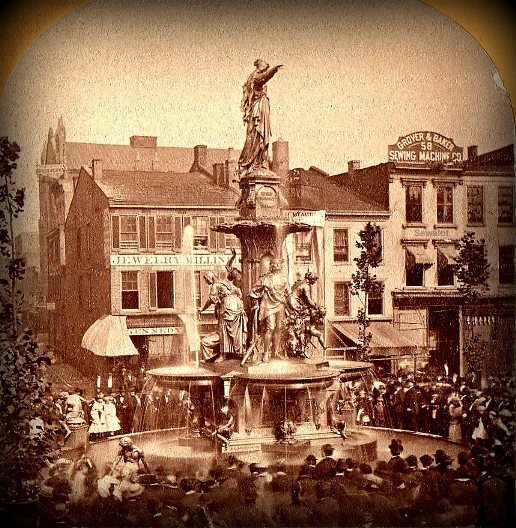 This amazing bronze German fountain from Munich, was placed in the City of Cincinnati by Henry Probasco in memoriam to his friend, business partner, and brother-in-law Tyler Davidson. What's brilliant is that it is now in the centre of high rise skyscrapers but back in 1871 you can see the Grover & Baker dealers behind the fountain. Kindly sent in by Eric Beckett. I enjoyed your website, sewing machine articles and especially the article on Grover and Baker. 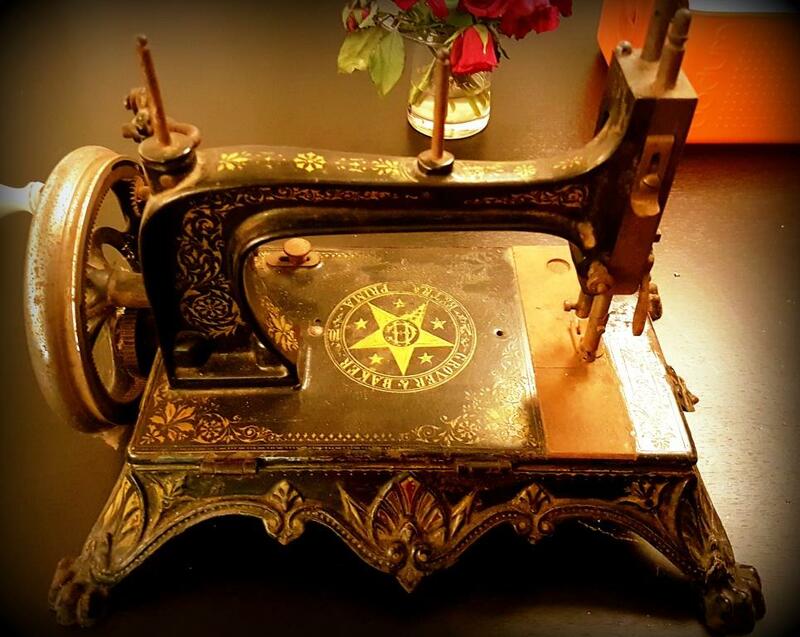 Author, Antique American Sewing Machines: A value guide. Grover & Baker 18 Summer Street, Boston. 730 Chestnut Street Philadelphia. I represent a small museum in central Missouri, known as Historic Hermann’s Museum. Our website is www.HistoricHermann.com. We are in possession of a Grover & Baker sewing machine. I did an online search for information about it and found your website. 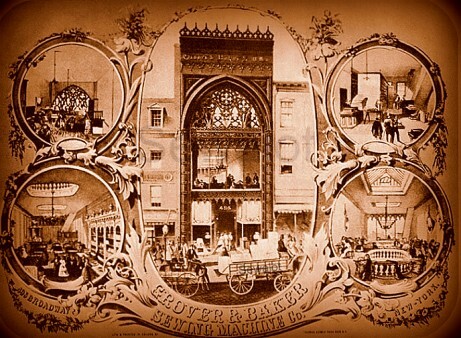 Thank you for providing a comprehensive history on Grover and Baker machines. Display Consultant for Historic Hermann, Inc.
Alex, Your site blows all others away. You must have spent a hundred years writing all this stuff...and for free! Thank you for all your research on these rare machines. I see others have copied a lot of it, you have a style that is easily spotted. It has been months since I contacted you about our Museum’s Grover & Baker sewing machine. We finally created a special exhibit for the machine and I wanted you to know that you are credited within the exhibit for the wealth of information your website provided. Again, thank you so much.